You won’t be able to keep your Paws Off our Dog Valentine’s Day Gift Baskets! When you’re a pet owner, the love you have for your four-legged friend is unlike any other. So why not show them how much you care on Love Day with a Dog Valentine’s Day Gift Basket? It’s the perfect gift to give them to let them know how much they really mean to you. Here are some of our favorite puppy loved filled gift baskets for you to choose from. Pawfect Love Dog Biscuit Bouquet – One of our cutest doggie gifts, the “Pawfect” Love Dog Biscuit Bouquet is ideal for your four-legged friend. It’s packed with homemade, Fido-friendly frosted dog biscuits, and wrapped in an insanely cute bucket. 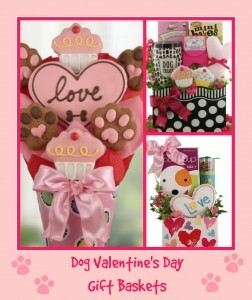 Showing them how much you love them will be easy when you give them this adorable dog Valentine’s Day gift basket! Diva Dog Gourmet Dog Gift – Is your pup a certified Diva? If so, our Diva Dog Gourmet Gift basket is perfect for them! It’s filled with the most glamorous puppy treats and princess-worthy chew toys, as well as packaged in a “too-cute-to-boot” polka dot container. What diva dog wouldn’t love receiving this? Love at First Bite Valentine Dog Gift – Even though they’re known to tear up some of our most prized possessions, our pups are our heart and soul. Pamper them with this Love at First Bite Valentine’s Day Dog gift and give them something else – besides your favorite sneakers – to chew on! Complete with the best gourmet dog treats, they’ll be chomping away at a yummy treat and feeling loved with this adorable Valentine’s Day gift! Want to see the rest of our Dog Valentine’s Day Gift Baskets? Visit us today at BisketBaskets.com! Know someone who really deserves your love this Valentine’s Day? We have the perfect gift for you to give them on February 14th – a Valentine’s Day Gift Basket from us! What’s better than combining some of their favorite things in gorgeous wrapping to show them just how much they mean to you? Here are some ideas of our favorite Valentine’s Day gift baskets to give that special someone this year! Red Hot Valentine Care Package – Does your sweetheart set your heart on fire? 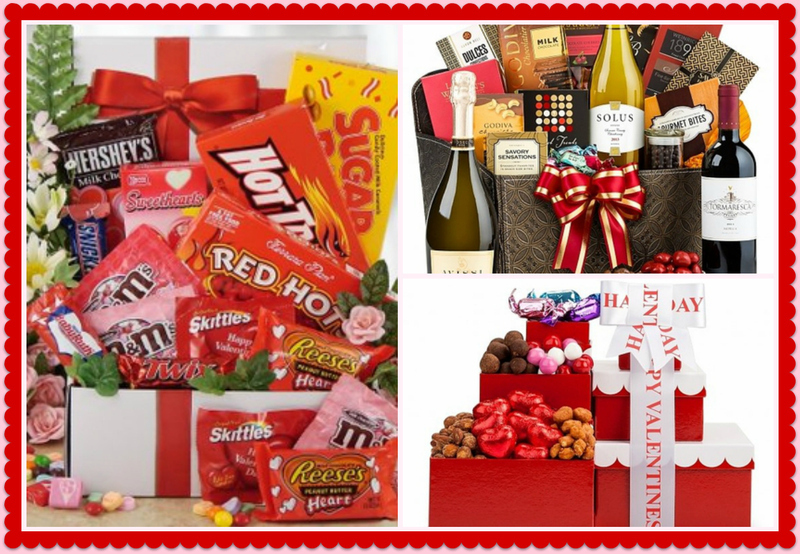 Show them how much you adore them with this sinfully sweet Valentine’s Day gift basket! It’s full of delicious treats – spicy and sweet – to shower them with love this holiday. Red Hot’s, Reese’s Hearts, and plenty of other candy is included in this gift for your sweetie! Fine Food & Wine Trio – This gift basket is ideal for the lover who is fond of the finer things in life. Complete with the finest chocolate, wines, and other delicious treats, you’ll be able to really treat the one you love with a combination of sweets and decadence! Cupid’s Delight Gift Tower– Shoot them down with Cupid’s golden arrow, and grab your other half this Cupid’s Delight Gift Tower. It’s filled with savor and sweet treats – including milk chocolate hearts, toffee peanuts, almonds, and more! It also comes in a fun and attractive tower, complete with red and white trimming for a festive touch. Want to see the rest of our Valentine’s Day Gift Baskets? Visit us today at BisketBaskets.com!